Save the turkey bones from your holiday dinner. You can use them to make a rich and flavorful turkey stock that is perfect for turkey noodle soup. 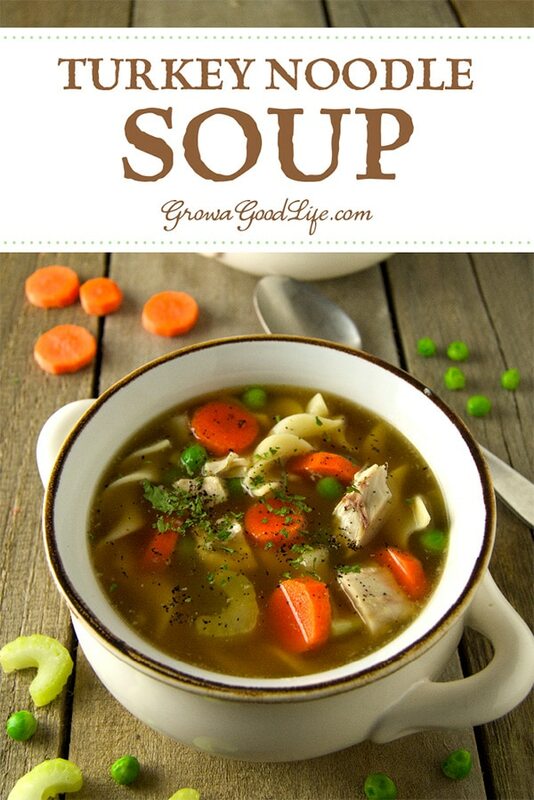 This comforting soup is a wonderful way to warm up on a chilly night. What I love about homemade soup is it is so adaptable. You can add whatever vegetables you have on hand. I love that I can use so many vegetables and herbs grown in the garden such as carrots, celery, onions, garlic, peas, and whatever leftovers I have in the refrigerator. You can make your own homemade egg noodles, use any shaped boxed pasta, or substitute rice for a gluten-free option. Cook the soup base and noodles separately to prevent the pasta getting mushy from absorbing too much liquid. When you are ready to serve, first add the egg noodles to your soup bowls, then add the hot soup. If your pre-cooked pasta is sticking together, run it under some warm water and the noodles will separate easily. 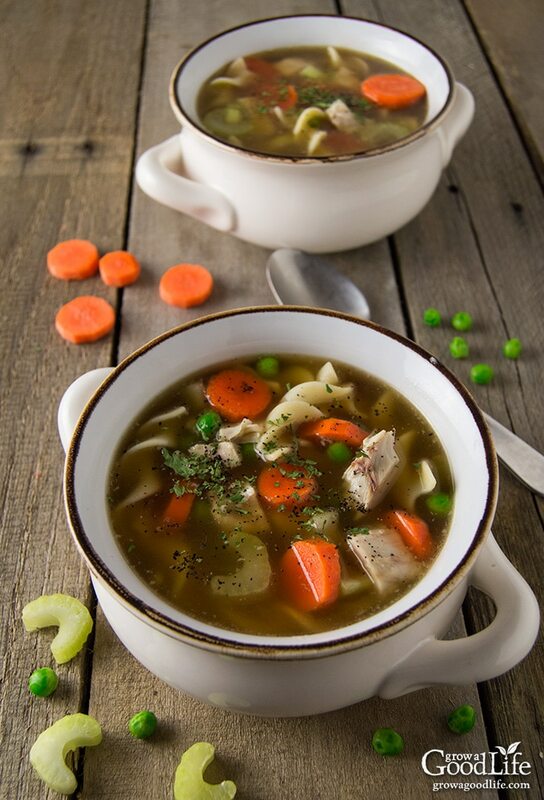 Whether you’re combating a cold or seeking a comforting meal, this turkey noodle soup is a perfect way to warm up on a chilly night. 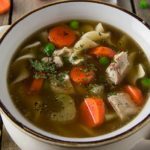 This is a basic recipe for turkey noodle soup, but I urge you to experiment and tweak to develop your own family favorite. 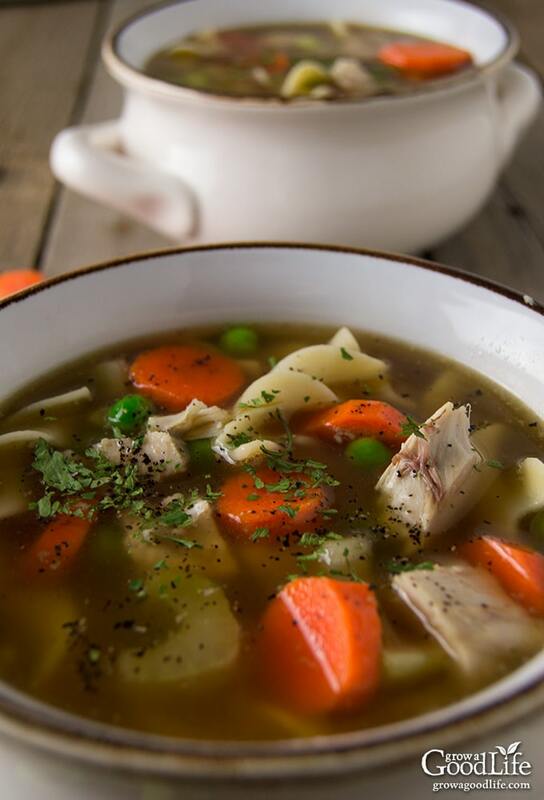 Whether you're combating a cold or seeking a comforting meal, this turkey noodle soup is a perfect way to warm up on a chilly night. In a large pot, cook your egg noodles according to the directions. Drain and set aside or refrigerate until you are ready to serve your soup. In a large pot, heat olive oil over medium-high heat. Add carrots, celery, onion, and garlic and sauté 3-5 minutes or until the onion is lightly browned. Add turkey stock, white wine, turkey meat, and sugar to the pot. Bring to a boil, then reduce the heat and simmer until the vegetables are cooked, about 5-10 minutes. Add peas to the saucepan and simmer for 2 minutes more. Add salt and pepper to taste. Keep warm until ready to serve. When you are ready to serve, first add the egg noodles to your soup bowls, then add the hot soup. Garnish with parsley and enjoy. Refrigerate extras keeping the pasta in a separate container to retain it’s firmness. You don’t have to eat turkey leftovers for a week after your holiday meal. I like to freeze the soup base in individual containers for an easy meal in the middle of winter. Simply heat up the soup base on the stove, boil up some pasta or rice, and you will have a homemade soup on the table in 30 minutes.